Approximately 2 hr event in the Museum (open from 10-4.30pm), come any time to complete your training session. Great fun and educational activities for the whole family. Ages 8-80. Could you identify our Zombie patient? Do you know the 10 other diseases that could turn you “Zombie Like”? Would you know how to avoid a disease epidemic? 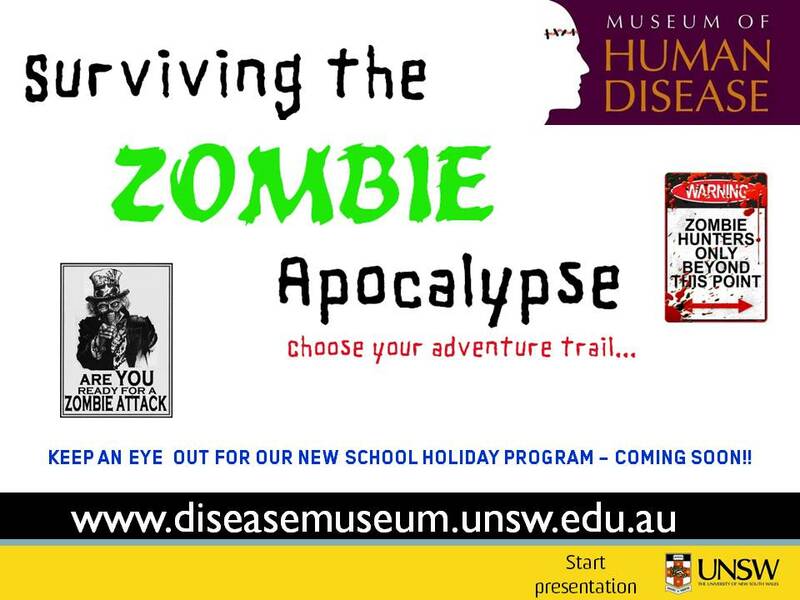 This is your last chance to spend the holidays training to defeat possible real Zombie diseases. Come anytime during the day, and enter the competition for the best dressed zombie, the scariest family, the best Zombie Genome, the Scariest Superbug. Enter the Zombie draw and design competition. Gresat prizes for the best zombie short film shot on the day. The Museum of Human Disease is Australia’s only publicly accessible medical disease museum – which means this is the only place to come face to face with the deadliest killers in Australia. We can also teach you how to avoid many of them – including the coming Zombie Apocalypse (also werewolves, SARS, influenza, Bird and Swine flu). The visit includes access to the Museum with over 2000 specimens of diseases, hands on activities for adults and children looking at the effects and prevention for a range of common and uncommon diseases. You might also like to enroll in one of the Museum’s dissection workshops and take a look inside real hearts, brains and other organs (using abattoir sourced animal organs). Mmmmm!